ePTFE, expanded Polytetrafluoroethylene, is a lightweight, yet strong, biocompatible and biostable material, chemically inert, and so, resistant to degradation by biological fluids, and, most importantly, can be stretched and deformed. ePTFE comes in multiple geometries; tapes, membranes, films, tubes, fibers, sheets, and rods. The material’s microporous structure makes it ideal for many medical applications, since it allows tissue in-growth and thus may prevents migration. Together with its biocompatible nature and deformation capabilities, this unique material has conquered the medical device Industry. The medical device industry quickly adopted ePTFE and today it is commonly used in many medical markets; self expandable metallic stents used in gastroenterology, as well as vascular covered stents, such as abdominal aortic aneurysm stents. ePTFE is also commonly used in cardiology, in structural heart devices, such as; heart valves, septal occluders, left atrial appendage implants, mitral valve clips, etc. Till today, one of the disadvantages of using ePTFE was the technology in which it was implemented onto the medical application, suturing. Suturing is a manual and time-consuming procedure. Suturing requires a minimum of two layers in the suturing area, thereby reducing lumen area and increasing the crimping profile. Medibrane’s experts overcame this challenge, and, using our unique Adhesion platform, developed the innovative Sutureless lamination technology, enabling good adhesion while eliminating the need of sutures. Since adhesion properties ensure the cover’s long-term attachment to the metal frame-based medical device, Medibrane’s experts have developed a high strength Adhesion platform, to improve adhesion. This unique platform consists of 2 stage; Surface treatment, in which the metal surface is prepared, using a variety of techniques, for bonding with the polymeric material, and Encapsulation coating, in which an ultra-thin polymeric membrane coats the frame-based device’s struts to a full extent, providing mechanical attachment between the polymer and the frame, and thus, better adhesion of the polymer. 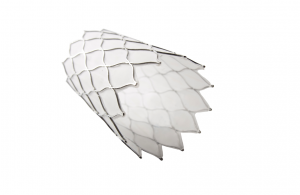 This new technology, in which ePTFE can be laminated onto the stent, without the need of sutures, enables our engineers to replace the old-fashioned suturing technique, with an innovational technology that enables metal frame covering by ePTFE, using an automated, reliable, fast and easy to manufacture process, yielding high quality products.